George Rogers Clark in his prime, by John Buxton. He was the frontier warrior the Indians most feared — The Long Knife: a killer, a conqueror, a burner of cornfields. George Rogers Clark was, with the possible exception of Benedict Arnold and Daniel Morgan, the most effective military commander the Americans fielded during the Revolutionary War. And, like Arnold, Clark was ill-treated by a feckless government. Arnold, as every schoolkid knows, turned traitor. Clark, the great Frontier Partisan fell far from the pinnacle of glory he hit at the age of 26; he would succumb to seething rage and bitterness and a savage appetite for drink. It’s hard for me to recount the tale of this titan among the Frontier Partisans. I stand in awe of what he accomplished and recoil from what he became. 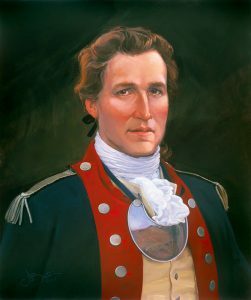 George Rogers Clark was born into the Virginia gentry — the rougher-hewn end of the gentry, a cut below Jefferson or Washington, but a member of a class that would provided extraordinary American warriors right up through the Civil War. He was a robust young man, with little formal schooling but enough to read and write well, and — like Washington — trained as a surveyor. He was tall, athletic, energetic and extraordinarily charismatic. Though he was just 19 when he headed west into the Ohio Country in 1772, he immediately established himself as a natural leader. When conflict with Great Britain broke out in 1775, he was quick to grasp the strategic importance — and the vulnerability — of the new settlements in Kentucky. Clark and a companion named John Gabriel Jones trekked east on the Wilderness Road to seek the protection of Virginia for the Kentucky settlements. Clark returned with a commission as a major in the Virginia militia — and 500 pounds of gunpowder, critical to the survival of the vulnerable outposts in what was now Virginia’s Kentucky County. The Revolutionary War got off to a slow roll on the Ohio Valley frontier, as the Shawnee, Mingo, Wyandot, Miami and other native peoples tried to determine where their interests lay in the white man’s domestic squabble. There were sporadic raids kidnappings and killings, but no all-out war. By 1777, though, a sizeable militant faction had decided that the British were the horse to back — they offered the best deal in trade goods, particularly arms and powder, and they at least gave lip service to Indian sovereignty and land rights. The American Long Knives, they knew, would not be denied their rapacious lust for ever more land. The frontier exploded in violent raids. Young as he was, Clark had a strategic vision that was none too common on that frontier. Very few militia officers could see or think beyond the static defense of a handful of palisaded forts. Clark did his share to defend such beleaguered posts, but he knew that this was ultimately a losing game. Terror and bloodshed would chase settlers back east and the settlements would fall. Clark defending a frontier stockade. Clark believed that he could best defend the settlements by penetrating deep into British/Indian territory north of the Ohio and capturing the posts from whence the raids on Kentucky originated. He conceived a bold plan to capture British posts in the Illinois Country — Kaskaskia on the Mississippi River and Fort Sackville at Vincennes on the Wabash River. Then he would muster a force to take the ultimate prize: Detroit on the Great Lakes. These were the depots that supplied Indian and Ranger raids, and the places where raiders returned to claim bounties for prisoners and scalps. The Indians were strategically vulnerable — they were utterly dependent upon British arms and powder to fight with. Seize the posts where they drew their arms and the campaign to harry the settlers out of Kentucky would collapse. In late 1777, Clark escorted a party of refugees out of Kentucky and back to Virginia. That mission was cover for his real purpose — a meeting with Thomas Jefferson and Virginia’s revolutionary governor Patrick Henry to pitch them on his grand strategy. The two Virginian luminaries were sold. Henry promoted the 24-year-old Clark to the rank of Lieutenant Colonel and cut two sets of orders: One for Clark to recruit 350 frontiersmen of the Upper Ohio into the Virginia militia for the defense of the Kentucky settlements; the other — secret — to take the Illinois Country for Virginia and the new United States. Clark headed to Fort Pitt, the key post at the head of the Ohio River and began recruiting. It went poorly. A long-standing feud between Pennsylvania and Virginia soured the Pennsylvania men; they weren’t inclined to sign on to protect Virginia settlements. And many men simply felt they had their hands full enough defending against raids at home. Why go off to foreign parts to hunt trouble when there was plenty to be found at the doorstep? Such recruiting problems would plague Clark at every turn. The young colonel ended up with fewer than 200 men, with whom he set off by boat down the Ohio. As they passed the mouth of the Kentucky River, they wondered why the hell they weren’t making a turn to the interior of central Kentucky. That’s where the settlements they were supposed to be defending were located. Clark took his force further downriver to the Falls of the Ohio, where they bivouacked on Corn Island in the middle of the stream. A few more men recruited from the Tennessee settlements to the south joined them. And Clark finally revealed their true mission. They were going to invade the Illinois Country. Great piece, Jim. Can’t wait for part two. Launched one of a handful of successful offensive actions during the whole war. And of course the government screwed him over at the end. Clark’s treatment was truly atrocious. We’ll get to it in part 4 of a four-parter. I have mentioned this before, but where you found Allan Eckert and his books, I found his doppelganger, James Alexander Thom. Thom did a lot with the Clark family, especially George Rogers Clark. I think Thom captured Clark really well. Including one John Carter. After meritorious cavalry service in the Army of Northern Virginia–amongst which he was accounted their finest swordman–he took his frontier partisan skills out West to Arizona. He eventually found himself in the wilds of Barsoom, where he both bonded with and fought against various desert tribesmen there. Yes, the Virginia gentry were a well-spring of fighting men and frontier partisans.